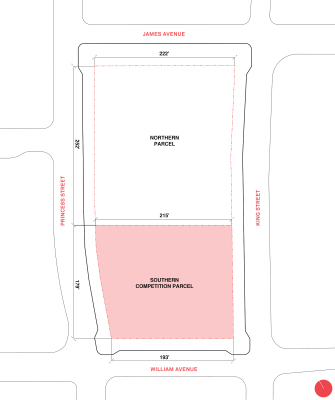 ​From July to December 2018, CentreVenture conducted an international design competition to choose a design team and architectural concept for the southern parcel of the Market Lands site. Twenty-three applications from around the world were submitted, five teams were shortlisted and the winner was selected by interdisclinary jury of designers and community representatives. ​​Daoust Lestage of Montreal and their 'new market square' was selected the winner. They will work with CentreVenture and community parners through 2019 to finalize the design for construction to commence sometime in 2020.